Not everyone is a fan of DIY work, so here is a simple and effortless solution. Just add a few large metal clips and you have a very useful toiletries storage system for your small bathroom. You can hang a lot of accessories on these clips. 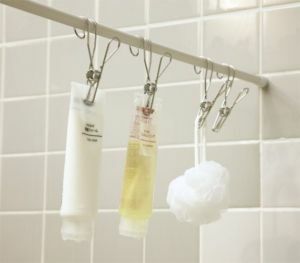 Not only the ones that you’ll need when in the shower, but you can also hang some underwear or small towel so that they are in reach. You can also use some other clips or hooks that could be attached to the curtain rod.